White River Division: Throwback Thursday - Meet the Cariboo Prospector. BC Rail's Cariboo Prospector has arrived at the Lillooet station at mile post 157.6 of the Squamish Subdivision on July 05, 1989. During the final couple of decades of operation, British Columbia Railway ran a number of tourist-oriented passenger trains. Best known was the Royal Hudson train, along with the Pacific Starlight Dinner Train and the short-lived Whistler Northwind. 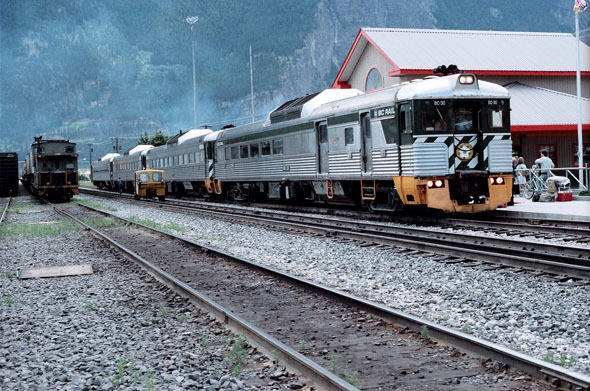 All of these trains were locomotive-hauled, whereas the regular passenger train, the Cariboo Prospector, operated exclusively with Budd RDC equipment. At the time of this photo there were nine such cars on the roster. The train in our photo was scheduled to depart North Vancouver at 07:00, with an arrival time at Lillooet of 12:30. This was a daily operation. Depending on the time of the year/day of the week, the two lead cars would continue north to Prince George over the Lillooet and Prince George Subdivisions. The trailing cars would return south to North Vancouver later in the afternoon. BC-30, the lead unit in the photo, was an RDC 3 built in 1956. The high cost of maintaining these vintage cars led to the eventual demise of all BC Rail passenger service on October 31, 2002.